Disabled rail access stuck on red light? More than 1,000 of the UK’s 2,500 railway stations need “urgent” upgrades to help disabled people, the government has said. But while efforts to improve the situation are being made, some disabled passengers in the West Midlands fear their problems could continue for years. One commuter who faces the problems on a daily basis is David Lewis, 30. A wheelchair user due to chronic arthritis, Mr Lewis travels the country giving talks on his condition. 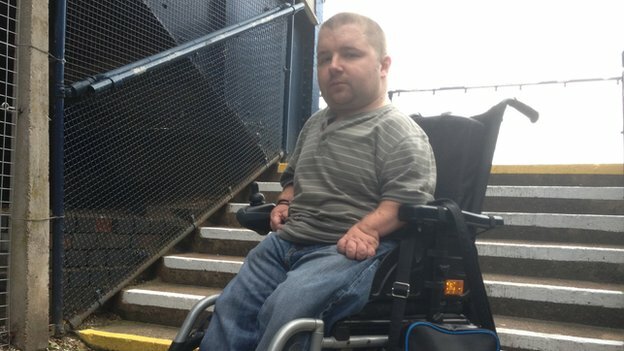 However, he cannot use his local train station in Acocks Green in Birmingham as it has no disability access at all. “I have regular appointments at Heartlands Hospital in Birmingham,” he said. “To get there by train should be free, due to my rail pass. He added: “Some stations are not even manned in the evening; and lifts are closed down in the evening too, so even if you can get there, there is nobody to assist you. “If I am travelling by train now, it takes days of preparation. I have to use the internet to find stations that allow access to disabled people and plot a route that way. Efforts to remedy the situation are ongoing, the government says. The DfT’s Access for All fund is a pot of £100m to cover access improvements to more than 150 stations in England, Wales and Scotland between 2014 and 2019. However, it has said it cannot guarantee when the improvements will be delivered to hundreds of stations nationwide that are not yet on this list. In the West Midlands, Birmingham’s New Street Station welcomes 31 million commuters through its doors each year. All platforms have lifts and escalators, all entrances have automatic doors and wheelchairs can be provided if needed. Yet within a few miles of New Street, 14 of the 69 West Midlands region’s stations are in need of disabled access upgrades but with no indication of when they will get them. For many, the timetable for improvements is not good enough. Residents in Kidsgrove, Staffordshire, complain their local station is not listed for improvements via the fund. Their MP, Joan Walley, says she plans to raise the matter in Parliament. Just a few miles down the track, Stoke-on-Trent’s station has full disabled access but eight of the 22 stations in Staffordshire are without similar facilities – and currently have no timetable for improvements. Others stations around the region, like their counterparts around the country, have ramp access to one or two platforms, but only stair access to others; drastically limiting the travel opportunities of wheelchair users. A spokesman for the DfT said: “The Access for All programme is currently delivering step-free access at over 150 stations. Other access improvements, such as hand rails, will be delivered to over 1,000 stations due to the programme. Stations across the country included in the extended programme are due to be named in early 2014. Until then, the daily struggle for millions of disabled commuters continues.